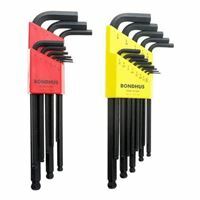 Bondhus 20199 Balldriver Tip Hex Key L-Wrench Double Pack includes 10999 (Set of 9pcs with ProGuard Finish sizes 1.5mm - 10mm) and 10937 (Set of 13pcs with ProGuard Finish sizes .050 - 3/8) perfect for when a variety of tool sizes are required. The wrenches slip easily into marked slots and twist to lock in place. ProGuard finish provides rust protection. 0.050", 1/16", 5/64", 3/32", 7/64", 1/8", 9/64," 5/32", 3/16", 7/32", 1/4", 5/16", 3/8"
22 L-wrenches= 1.5mm, 2.0mm, 2.5mm, 3.0mm, 4.0mm, 5.0mm, 6mm, 8mm, 10 mm, 0.050", 1/16", 5/64", 3/32", 7/64", 1/8", 9/64," 5/32", 3/16", 7/32", 1/4", 5/16", 3/8"